The 2016 World Champion Boatyard Dog is......Travis! John Williams is building a new Williams 38 that will retain the classic good looks of a Stanley above the waterline, but feature a modern V-shaped underbody and engineering designed to send it through the water at up to 40 knots. Fascinated by technology old and new, mechanic Lincoln Davis not only breathes new life into cranky old engines and boats, he also has built an extraordinary collection of them. 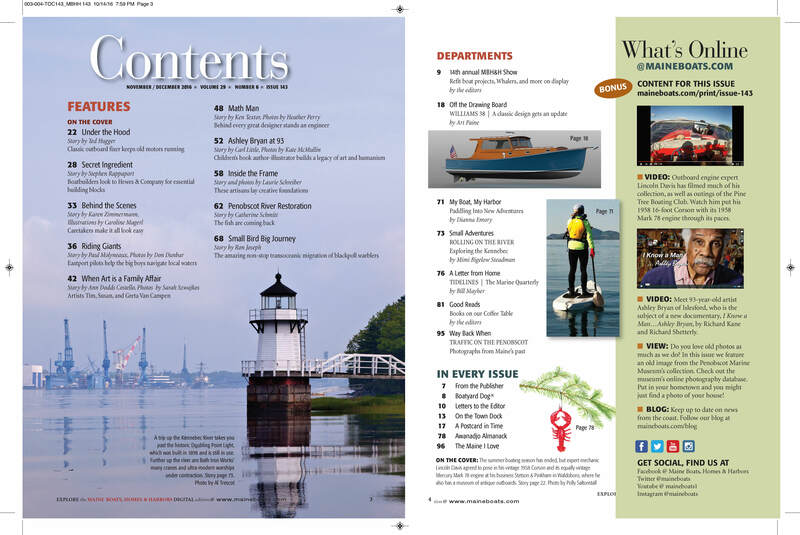 Many people know of Hewes & Company as a builder of fine homes, but the company also has a thriving business fabricating parts for many of Maine’s best known boatbuilders as well as for designers from the United States, the United Kingdom, and Europe. Caretakers work year-round to maintain seasonal homes and cottages, with great care and attention to detail. Eastport pilots help the big boys navigate Cobscook Bay’s potentially treacherous waters. Is a child whose parents are successful artists inclined to become an artist, and when this happens is it the result of genetics or due to being raised by artists in a home full of art? In the case of Tim, Susan, and Greta Van Campen, it was probably a bit of both. Behind every great architect stands an engineer. Meet Albert Putnam. At 93, artist and author Ashley Bryan is still hard at work. His newest children’s book, Freedom Over Me, tells the story of slaves. The people who make the art often get our attention, but who stretches their canvases and who makes their frames? Meet a husband-wife team that creates gorgeous frames, and a pair of talented canvas makers. A multi-year project to remove dams and restore the Penobscot River is paying off as fish populations rebound. Blackpoll warblers fatten up and add muscle before making a non-stop 80- to 90-hour transoceanic flight from Maine to Venezuela. A day trip up the Kennebec River and through Merrymeeting Bay to Hallowell and back provides a scenic adventure. The Marine Quarterly journal is a literary escape of the marine sort for the winter months. The close of the year brings holiday traditions, chilly weather, and hibernation for all of nature's creatures. An early-1900s view of the Penobscot River from the book "Maine On Glass," show an array of vessels. Scenes from Maine by Ryan Burnham. VIDEO: Outboard engine expert Lincoln Davis has filmed much of his collection, as well as outings of the Pine Tree Boating Club. Watch him put his 1958 16-foot Corson with its 1958 Mark 78 engine through its paces. VIDEO: Meet 93-year-old artist Ashley Bryan of Islesford, who is the subject of a new documentary, I Know a Man…Ashley Bryan, by Richard Kane and Richard Shetterly. VIEW: Do you love old photos as much as we do? In this issue we feature an old image from the Penobscot Marine Museum’s collection. Check out the museum’s online photography database. Put in your hometown and you might just find a photo of your house!